Please note style has changed slightly and no longer has sheer panel at midriff. Costume is slim fit, additional sizing information here. NB. Waist measurement is fabric length, unstretched. 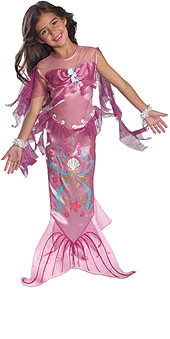 Let your imagination run wild and splash around with your fishy friends while wearing this adorable Pink Mermaid Costume. Collect pearls and seashells while you pretend to swim alongside your other mermaid buddies and swish your mermaid tail.